With the rapid urbanization of Colombo the availability of natural soil has become a cause for concern in many cities. Since the nation seems to be running out of soil, there is one option and that is growing in liquid medium. 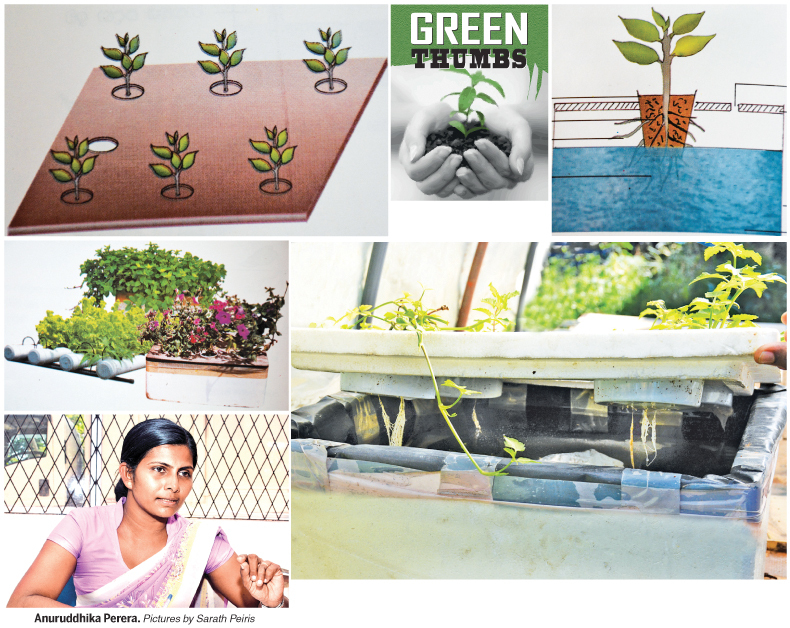 Green Thumbs speaks to Agrarian Service Center, Maharagama, Agriculture Instructor Anuruddhika Perera on the Hydroponic System. It’s not uncommon for a plant in liquid fertilizer medium to grow at least 20 per cent faster than soil gardening. On top of that, plants will typically yield at least 25 per cent more than their soil counterparts. “In many cities in Colombo the lack of space is a problem. But the even bigger problem is the lack of soil. A solution is the Hydroponic System. There is a simple way of using this system in your extent of land with a Rigifoam or any other container that should be able to hold one liter of water. When we use this Hydroponic system there is no need for soil. This is because we are using the liquid medium. This liquid medium is the Liquid Fertilizer known as the Albert Solution,” said Perera. The Hydroponic technique is ideal for areas with limited spaces. The reason for faster growth rate and greater yield is because it is easy for the plant to get the nutrients they need to grow. When they have to struggle less to find pockets of water or nutrition like they would in soil, they can divert that energy to growth. “One thing we need is black polythene with a 0.15mm thickness. We then take the container and cover the bottom of the container with the black polythene cover. This is to create the darkness needed for the roots to grow. Because when the plant is growing in the soil, the roots are in darkness. Then the container is filled with the Albert Solution. The lid covering the container needs to have holes in proportion with the container. They also need to be big enough so that a plastic/ disposable cup can be fitted into them. After that we fill the cup with coir dust medium and plant the seeds in the cup. The cups are then fitted into the holes. The cups in turn need to have tiny holes so that the roots can go through them and access the liquid fertilizer. The roots absorb the fertilizer from the medium,” explained Perera. Perera also pointed out that there needs to be another hole in the lid so that ventilation can be provided. This hole needs to be covered by an insect prevention net, to protect against insects. The holes in the lid also need to have a proper distance from each other. “One reason we use chemical insecticides and chemicals is so that the insecticides can kill the insects and the chemicals can make the outside appearance of the vegetables and fruits look attractive. This Hydroponic system can be used for vegetables such as tomato, cabbage, radish, chili, bell pepper and salad cucumber. It can be used for fruits like melons and strawberries. It can be used for leafy vegetables like lettuce, Kang Kung and Gotukola. 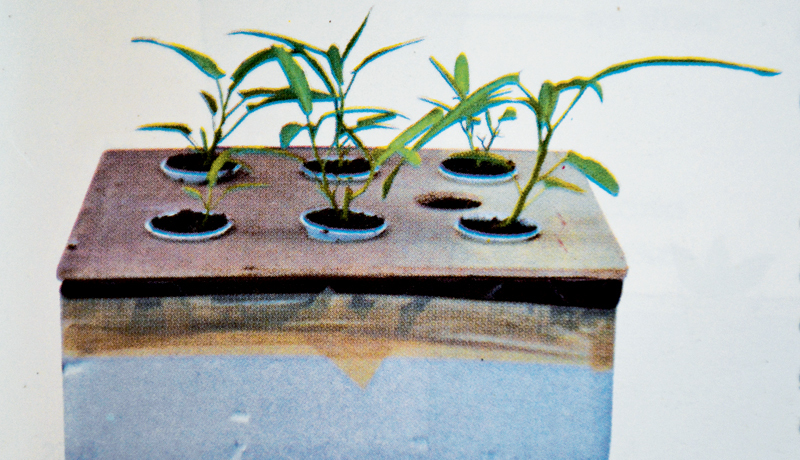 The Hydroponic system is an easy and simple technique. Strawberries are grown commercially in Nuwaraeliya and has a delicious taste and the quality and shape is good,” pointed out Perera. When preparing this liquid solution there needs to be ample morning sunlight. One must keep in mind that in one container only one crop needs to be grown. It is not difficult to get your hands on the Albert Mixture. It can be bought from an agro-chemical shop. Perera added that one way of knowing that more fertilizer is needed is by judging the condition of the crops. The leaves turn to a yellow color, the green color decreases and the growth rate decreases. Then we know that more fertilizer is needed. “It is also important to observe the plant. This is so we can spot any pest attacks. If we see signs of a pest attack, we can remove the damaged plant parts. Or we can used an organic pesticide such as Neem extract or Neem oil,” said Perera Another benefit is there is no weeding necessary. No soil means there are no weeds. It also saves you the time of weeding, pest control and watering. You also save up on watering because a plant’s roots will only take up the amount of water they need at any one time and leave the rest in the reservoir for later. The reservoir is covered to prevent evaporation and no water can seep out of the bottom. We need to keep in mind that the Hydroponic system gives one the ability to control the growth aspects of the plant, meaning you have more control. It is relatively inexpensive and easy to construct at home. Take black polythene with a 0.15mm thickness. Take a container and cover the bottom of the container with the black polythene cover (This is to create the darkness needed for the roots to grow). Then the container is filled with the Albert Solution. The lid covering of the container needs to have holes in proportion with the container. They also need to be big enough so that a plastic/ disposable cup can be fitted into them. After that fill the cup with coir dust medium and plant the seeds in the cup. The cups are then fitted into the holes so that the roots can go through them and access the liquid fertilizer.